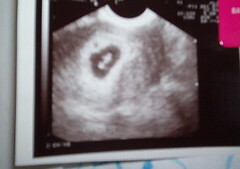 Nicole's Needlework: My little peanut! Not much else going on... just heartburn. I hate Tums. Write more later! Congratulations on your little "peanut". I had to leave a comment, because ob/gyn sono is what I do! I'm happy for you. Congratulations indeed! I'm 15 weeks along, and had our first little picture last week too. Apparently this means that I feel compelled to comment when other people show their ultrasounds too. I started and finished something today!